World 5-2 (Chapter 5-2 in Yume Kōjō: Doki Doki Panic; titled Attack in the Dark!) is the second level of World 5 in Super Mario Bros. 2. This level is set mostly on land, unlike the previous stage; there are not many obstacles, so most of the difficulty is based on the diversity of enemies (such as Hoopsters and Porcupos) found. At some point, a large mountain must be climbed through various vines, then the player has to fall through a deep hole full of spikes, which can only be avoided with quick reflexes. Red Birdo is fought over a cascade. In Super Mario All-Stars and Super Mario Advance, this is the only level in World 5 to be set at night unlike the NES version where its three levels are all set at night. 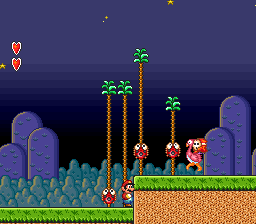 In the drop area where the player must grab the POW to advance on and head to the door leading to the battle against Birdo, the underworld theme plays in that area in the original 8-bit versions, despite being still outside. This was corrected in Super Mario All-Stars and Super Mario Advance, where the overworld theme would still play after entering that area. ↑ Super Mario Bros. 2 Inside Out, Part II. Page 6.